A speaker output that plays the Morse code. The frequency of the sound output is approximately 1 kHz. Listen to a sample 'hello world' output. (please let me know if there is something wrong with this code). The image below shows you what the LCD output looks like. The first line is the text I've typed. The second line contains some instructions on how to use the device. You can either press ENTER to send the data, or ESC to clear the data. Morse is a communication code that was invented by Samuel Morse. It is used to transmit text information as a series of on-off tones (or lights). 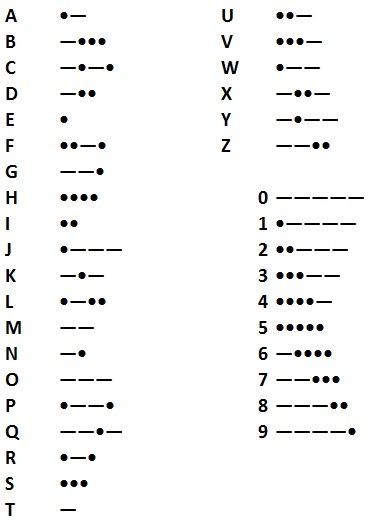 This code was invented in 1835 to be used for telegraphy. Nowadays it is replaced by digital telecommunication systems but it is still in use by a number of hobbyists. Each letter of the alphabet is represented by a certain number of dots and dashes. My typewriter will convert the typed text into these codes. The following diagram illustrates the setup of the typewriter. The device is operated by a PIC microcontroller (16F628A). This controller will read the PS/2 keyboard. This incoming data is shown on the LCD module. The Morse code is played on the speaker and LED when you press the ENTER key.